← Little Free Library — Brilliant Idea! First, I want to congratulate Gigi because her latest book, COME AUGUST, COME FREEDOM, is a finalist in the Library of Virginia’s People’s Choice Awards! Hooray! (Voting is open until June 30th.) It’s a particularly important book for Virginia, documenting — in novel form — what it must have been like for the enslaved Gabriel and his compatriots to try organize a rebellion in 1800 and attempt to gain their freedom. Gigi researched and uncovered fascinating documents pertaining to his life and the times. I think it should be required reading in every Virginia school, at least. Gigi has written a variety of acclaimed books all dealing with different, and tough, issues: CLAIMING GEORGIA TATE, A CERTAIN STRAIN OF PECULIAR, CHANCEY OF THE MAURY RIVER, and its sequel coming this summer, MACADOO OF THE MAURY RIVER! To get to know the lovely Gigi better, I asked her to answer some questions for us — enjoy! Summertime and the living’s easy. I love summer! A redbone coonhound named Biscuit and two horses: Albert and Latte. Favorite sport or form of exercise? Yoga and horseback riding. Or, yoga on horseback! My favorite sport to watch is VCU Men’s Basketball. Language in which you’d most like to be fluent. I studied Russian in college, and wish I had made the time to really immerse in the language. But, I really wish I had studied Latin. It seems like people who know Latin know their way around words and language very well. Country you’d most like to visit. Wales. I’d like to go listen to some storytellers and ride horses in the mountains. What / who gives you spiritual guidance and inspiration? The Bible, nature, my horse, and my grandparents inspire and guide me. What’s an important “nugget” that you’d like readers to take away from your book? Come August, Come Freedom is based on the historic events surrounding Gabriel’s Rebellion, one of the largest slave rebellions ever organized in U.S. History. The leader of the rebellion, an enslaved blacksmith named Gabriel, was born in 1776 and was executed for the conspiracy in 1800. I hope readers will take away the nugget that our history is full of heroes and sheroes who we may not read about in textbooks. Why did you write this book / choose this topic? The historical record on Gabriel’s Rebellion is so fascinating. His is a story about power, politics, military strategy, the early republic, and the insistence of enslaved Americans to determine their own lives. I work full-time, so I write when I can. Early in the mornings, late at night, and all day on Saturdays and Sundays! All sorts of places! In the winter, I sit in the big wing chair in our living room with a fire burning in the fireplace. During spring and summer, when the river is low I like to write on a big rock in the James. I LOVE to revise during half-time at basketball games. And, I get some writing done in my office, too. My dog, a composition notebook, and a Ticonderoga #2 pencil. Often ideas come while I’m walking or practicing yoga. Lots of ideas occur during research, too. 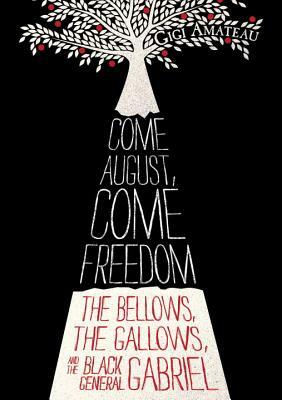 No, there’s no sequel to Come August, Come Freedom, but I might write about a different man who was involved in the rebellion. Right now, I’m working on the third book in the Horses of the Maury River series. The second book, Macadoo of the Maury River, comes out this August. And, also this summer, I’ll release a mobile app based on the first book, Chancey of the Maury River for the iPad, Nook, and Kindle. Why should kids read books when there are so many other things to do? Because readers are leaders. If you look back over history, those who determine their own lives and those who change the world can read, including the blacksmith Gabriel. I love that, Gigi! Thanks for the interview! To learn more about Gigi, please visit her website. Happy reading! Still, I admire your ability to work with any noise, Gigi! The Imitation Game — It’s the bomb!